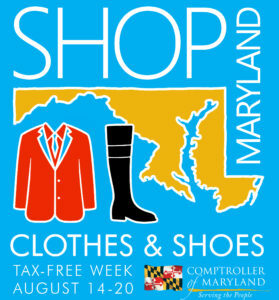 Maryland Tax Free Week 2019 Sales Tax Holiday details inside. Maryland Tax Free Week 2019 is Sunday, August 11th, 2019 to Saturday, August 17th, 2019. That means qualifying apparel and footwear $100 or less, per item, are exempt from the state sales tax. Accessory items are not included. Check out our Facebook event for this. • Taxable services performed on clothing or footwear, such as alterations. Example: sales tax is due on alterations to clothing, even though the alterations may be sold, invoiced, and paid for at the same time as the clothing being altered. Maryland Energy Star Tax Free Weekend 2019 is from February 16th to February 18th, 2019. There is a tax-free three-day weekend every February during which the Maryland state sales tax will not apply to the sale of any Energy Star Product listed below, or solar water heater. Energy Star Product means an air conditioner, clothes washer or dryer, furnace, heat pump, standard size refrigerator, compact fluorescent light bulb, light-emitting diode (LED) light bulbs, dehumidifier, or programmable thermostat that has been designated as meeting or exceeding the applicable Energy Star Efficiency requirements developed by the U.S. Environmental Protection Agency and the U.S. Department of Energy.